BUTLINCAT's BLOG: DISGUSTING: "Tory MP GEOFFREY COX makes £670,000 in one year (... but still charges taxpayers £94.74 for his new fridge)"
DISGUSTING: "Tory MP GEOFFREY COX makes £670,000 in one year (... but still charges taxpayers £94.74 for his new fridge)"
David Cameron and his former Chancellor, George Osborne, have attracted headlines with their huge fees for public speaking engagements since they quit Downing Street — but a little-known backbencher has outshone them when it comes to second jobs. I can reveal that Tory MP Geoffrey Cox earned almost £670,000 on top of his £74,962 parliamentary income in the past year. 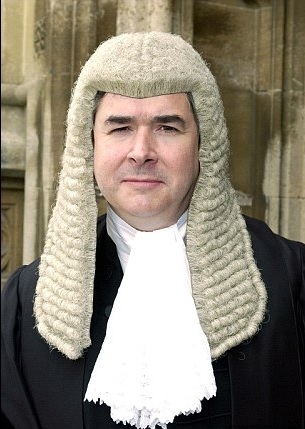 He earned the vast sum — equivalent to 25 times the average national wage — through his work as a barrister. One of his jobs providing legal advice netted him nearly £147,000 for around 80 hours’ work. All Cox’s earnings in his barrister capacity were subject to a 13.5 per cent deduction for the costs of his chambers. Despite his vast income and MP’s salary, Cox has still claimed almost £16,500 in expenses so far in this financial year. In September, it was revealed that the MP for Torridge and West Devon charged taxpayers £94.74 for a fridge in his constituency office. He previously had a 49p expenses claim for milk rejected. In total, Cox has registered income of £666,922.22 in the past 12 months — although some of this relates to work carried out earlier. His income is derived from a variety of legal firms in the UK, but also includes earnings from three companies in the tax haven of the Cayman Islands. Earlier this year, he was reprimanded for failure to declare £400,000 of earnings in 2015. Cox, who previously sat on the MPs’ Standards Committee, was forced to make an apology, but escaped any formal action being taken against him. The MP referred himself to the committee, which found that he had committed a ‘serious’ breach, but accepted he had not intended to hide the earnings. Cox stepped down as a member of the sleaze watchdog in October last year, when it emerged he had repeatedly missed the deadline. When criticised over the level of his earnings in the past, Cox argued that his tax bill is greater than his MP’s salary. He said he worked 50 to 60 hours a week in and for his constituency, carrying out his legal work during parliamentary recess or at weekends.